Today’s obsession with productivity has created a surplus of solutions promising to help us manage to-do lists. 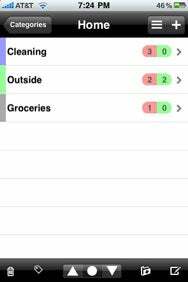 Included in that number is CheckSheet, a $3 app from MagickWorX that aims to help you create and organize a series of lists and items for getting things done. Unfortunately, CheckSheet fall short of delivering on that promise. To Don’t: CheckSheet’s interface may look plain, but don’t be fooled—it’s not very intuitive, leaving you to your own devices to figure things out. CheckSheet provides three organizational levels—categories, sheets, and items. By default, the app also includes three unmodifiable categories—templates, all, and unclassified. Of course, you can add, delete, and modify any number of custom categories. You can assign a due date, priority, description, text color, URL, telephone number, mail address, and photo data to each item. Still, even with all those assignments, the only changes to an item visible in the sheet are its due date and text color. Accessing, viewing, or even knowing about the other information requires tapping the Details button next to the item. One nifty feature to CheckSheet is its ability to copy entire items to the clipboard and then transfer them to a new item in a different sheet. You also have the ability to copy or move from one category to another. It’s also possible to e-mail sheets and tag items. Sadly, though, CheckSheet doesn’t have a very intuitive interface; you’re left to your own devices to figure things out. I found navigating my way through the menus to be daunting and complicated. There are no help videos, and the app’s Web site only gives information on what you can do, not how to do it. In addition, most every button is graphic-based, so the only way to know its function is to tap on it. Some common buttons might help users find their way, but those features are missing in CheckSheet. There’s no edit button. There’s also no delete function in the menu; instead you have to go into an item or category to delete. While this isn’t that big of a deal when looking at the big picture, it can slow you down. When it’s all said and done, CheckSheet is a simple checklist manager gone terribly complicated. While it can get the job done, it’s hard to use and often frustrating. CheckSheet is capable of serving as a full-time to-do list application, but it’s poorly constructed. There are better alternatives out there. CheckSheet is compatible with any iPhone or iPod touch running the iPhone 2.1 software update.